(TibetanReview.net, Jun20, 2015) – The Chinese parliament, the National People’s Congress (NPC), has on Jun 18 condemned “a few Hong Kong lawmakers” who had defeated a government electoral reform proposal for the direct election of the special administrative region’s chief executive in 2017. Pro-democracy legislators of the Hong Kong Legislative Council (LegCo) opposed the plan as it required the candidates for the election to be vetted and approved by Beijing, making it a fake democracy plan. 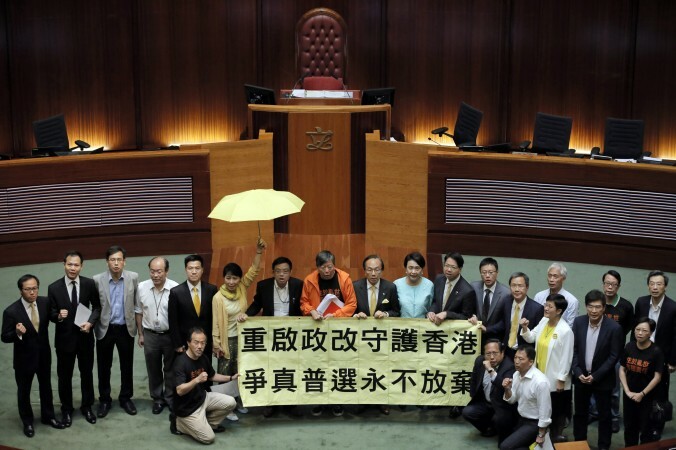 The proposal needed the support of more than two-thirds of the 70 LegCo members in order to become law. It was rejected, after a lengthy two-day debate, 28-8 votes. The remaining 34 lawmakers did not cast their votes in a bungled attempt to delay the vote by depriving it of a quorum by walking out of the legislature chamber. They later blamed it on “communication gap”, explaining that they were waiting for a fellow politician who was ill to return to the chamber and had asked for a 15-minute break, reported AP Jun 19. But with at least 47 of the 70 votes being needed for approval, there was no hope for the proposal becoming law. NPC has accused “a few Hong Kong lawmakers” for “insisting on their stubborn confrontation against the central authorities”. It emphasized that its decision on Hong Kong’s electoral reform approved in Aug 2014 will remain in force in the future, despite the plan having been vetoed in the LegCo, reported China’s overseas party mouthpiece Global Times Jun 19. Currently the leader of Hong Kong, the chief executive, is hand-picked by such a 1,200-member panel of pro-Beijing figures. The reform package offers direct election but the candidates have to be vetted and approved by this panel. This means the race is off-limits for candidates not approved by Beijing. Pro-democracy leaders say Beijing is breaking its promise to eventually grant genuine universal suffrage to the city, which, as a special administrative region of China, has its own legal and financial system and civil liberties such as freedom of speech denied on the mainland. The defeat is seen as likely to result in a political stalemate for years to come, with both the sides not being willing to concede defeat.